First was Michael Conforto, then Yoenis Cespedes. Two innings passed, and Neil Walker and Lucas Duda joined in. Curtis Granderson wanted to get in on the fun, too. 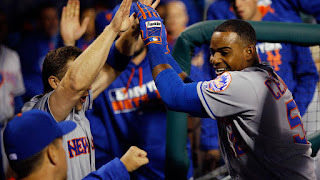 By the end of the Mets' 11-1 win over the Phillies on Tuesday night, five Mets had put balls over the outfield walls of Citizens Bank Park, including two from Walker. Two pitchers entered Tuesday night having yet to allow a run in a start, but only the Mets'Logan Verrett escaped with that still intact. Verrett tossed six scoreless innings and has now led the Mets to wins in both of his spot starts in place of Jacob deGrom, who is expected to make his next scheduled start. Verrett also reached base twice and scored on Cespedes' third-inning home run. Bullpen blowup: As if the five runs the Mets scored against Velasquez weren't enough, New York continued to pile on against the Phillies' bullpen once Velasquez was pulled in the fifth.Brett Oberholtzer and James Russell combined to pitch three innings, in which they gave up four home runs, amounting to six runs. Philadelphia entered Tuesday with the fourth-worst bullpen ERA in baseball (5.49). After the Mets massacre, their ERA is now 6.14.